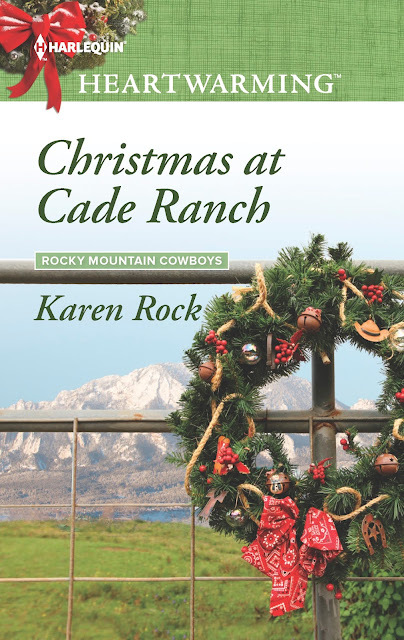 Getting Your Read On: On Tour with Christmas at Cade Ranch by Karen Rock + $50 and Book Giveaway! 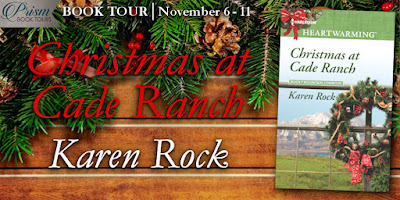 On Tour with Christmas at Cade Ranch by Karen Rock + $50 and Book Giveaway! Karen Rock is one of my favorite author in the Harlequin Heartwarming line. She is so good at telling me a story with characters I feel something for. I am loving this Cade family! I sure am glad this is a big family with plenty more stories to come. Sofia is a single mother, struggling to take care of her boy. She's made some mistakes in her life, but ever since becoming a mother, nothing has been more important to her than her son, Javi. I loved Sofia. She is strong and determined and such a good mother. She fills Javi's life with love. I had such a growing respect throughout this book for Sofia because she did what was best for Javi even when it meant swallowing her pride and doing things that were hard for her. She has the heart of a mother. James is Sofia's polar opposite in most ways. But one thing they share in common is love for their family. James is pushy and bossy. He is a stickler for rules because rules keep people safe. James and Sofia both both learn and grow throughout this book and that is always a satisfying journey as a reader. If you are looking for a book to put you in the holiday spirit, this book has plenty of that as well. 'Tis the season for a good Christmas romance! 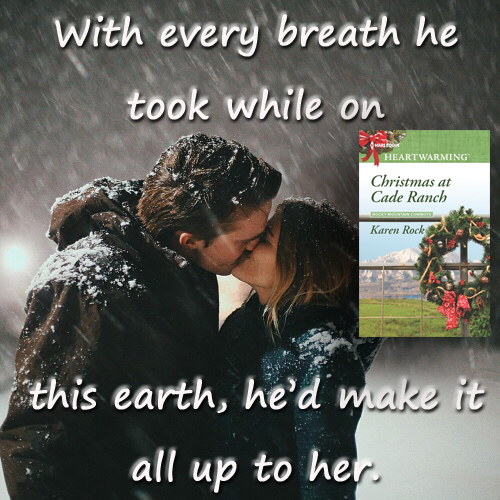 I can't wait to get back to Cade Ranch with the next book. In a quest to provide her ELA students with quality reading material, educator Karen Rock read everything out there and couldn't wait to add her voice to the genre. In addition to her work as a Young Adult romance novelist, she's now an author for Harlequin's Heartwarming line and thrilled to pen stories that moms can share with their teenage daughters. She's loved Harlequin books since she spent summers going through her grandmother's Presents books that she passed along in paper grocery bags each year. 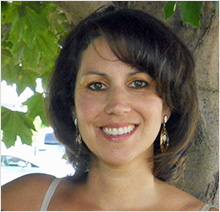 As half of the writing duo J.K. Rock, Karen also pens young adult romance. When she's not busy writing, Karen enjoys scouring estate sales for vintage books, cooking her grandmother's family recipes, reinventing her gardens to suit her moods and occasionally rescuing local wildlife from neighborhood cats. She lives in the Adirondack Mountain region with her husband, her very appreciated beta-reader daughter, and two Cavalier King cocker spaniels, who have yet to understand the concept of "fetch" though they know a lot about love. For more information about Karen's upcoming books, check out her website. 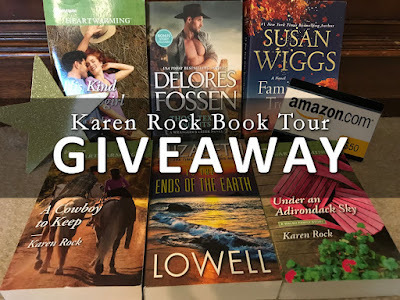 - 1 winner will receive a $50 Amazon gift card along with print copies of HIS KIND OF COWGIRL, UNDER AN ADIRONDACK SKY AND A COWBOY TO KEEP by Karen Rock, TO THE ENDS OF THE EARTH by Elizabeth Lowell, THOSE TEXAS NIGHTS by Delores Fossen and FAMILY TREE by Susan Wiggs.- US Only. I read this and really loved it. I am sure everyone is going to enjoy it! Hey, ranches aren't the only thing that can stay in the family.